Apple significantly beefed up the iPad mini, including a fully laminated and a brighter display at the max PPI that the iPhone maker supports —326 —all powered by the A12 Bionic processor. The chip isn't new, but it is new to the iPad mini and it really pushes those pixels. We started out playing Fornite at 30 fps with our SteelSeries Nimbus XL controller. Using the controller is great with an iPad mini as the display. It is easy to prop up the ever-so-light tablet almost anywhere. The game felt fluid and fast with no ridiculous load times. Soon after, we wanted to try playing freehand, sans controller. The iPad mini still has large bezels on the top and bottom which is still good for a gaming device that you have to grip. This makes it easy to hold while keeping your hands largely off the display —other than to use the controls. One downside we ran into, is that when holding the tablet our hand covered the lower of the two speakers iPad mini has, muffling the sound a bit. Something we noticed quickly with the new iPad mini is the fully laminated display. The 2018 iPad still uses a non-laminated display which puts a layer of air between the glass and the screen itself. By laminating those two together, it brings the content closer to your fingertips. This gives you the feeling of more closely interacting with the game, especially with the speediness of the A12. We did try moving the frame rate up to 60 fps to see how it handled it, and the iPad mini played through without issue. The game felt immediately smoother and this was how we kept it for our future battles. It was a much better experience than we've seen before, on a more portable form-factor than the iPad Pro. The 2019 mini also supports the P3 wide color gamut so the colors within "Fortnite" really popped. It was brighter too, which made a big difference when playing outside —now that the weather is finally warming up. When we look at our other options, the iPad mini really shines as an excellent portable gaming solution. The screen is a perfect size for portability but maintains a high resolution. Our Nintendo Switch has about 2/3 the resolution of the iPad and doesn't look nearly as good. 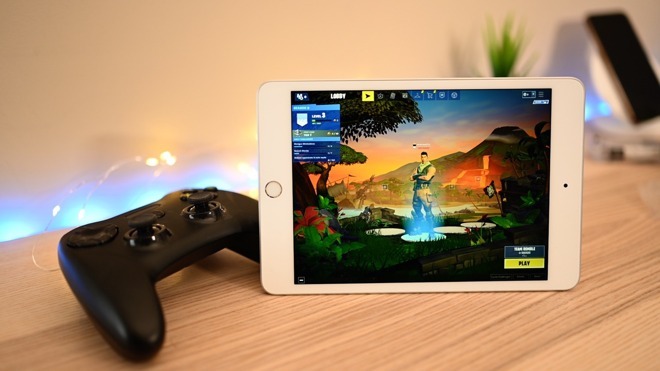 You can't use an iPod Touch to play "Fortnite" as it requires at least 2GB of RAM. You could use an iPhone but even with the XS Max the screen isn't as large and your hands block part of the content. 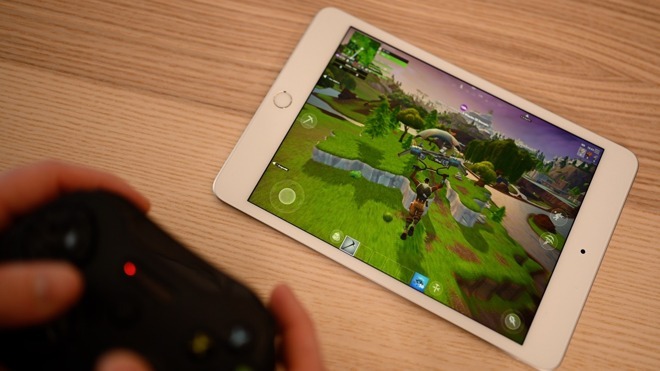 "Fortnite" was a delight to play on the iPad mini and with its power, size, and display. We have no doubts about our new device of choice for handheld gaming. Apple authorized reseller Adorama is currently knocking $10 off every iPad mini 5 exclusively for AppleInsider readers. To activate the code, you must use the special pricing links below or in our iPad mini Price Guide and enter coupon code APINSIDER in the same browsing session. Deal ends March 31.